Do you have a birthday tradition? Since my birthday is two days before Christmas, I am usually somewhere far, far away from the office, and typically very, very near to a pedicure chair and a good cocktail. Beyond that, I don't have too much of a "tradition" on my birthday; I just like to be relaxed, have fun and be with my family and loved ones. Others I know have traditions like taking a birthday trip, or doing a birthday physical challenge like a marathon (who are you people?! ), or even going on a shopping spree at the mall with birthday money. Dinners out are the norm, as are drink dates with friends. 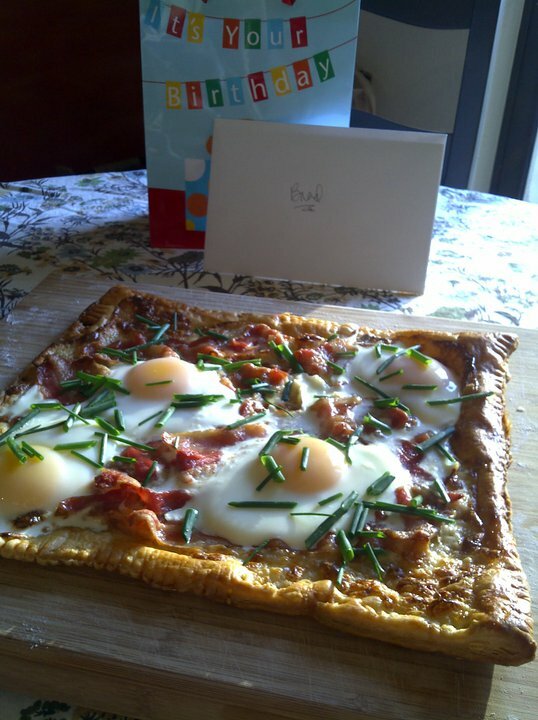 However, not very many people I know like to make a Birthday Breakfast a "thing" for their big day. And what a shame, too, since the popular weekend brunch places are that much easier to go to if you happened to stop by on whatever weekday your birthday lands. Thaw puff pastry dough overnight in the fridge. Preheat oven to 425, and put bacon in on a cookie sheet to cook until crisp, about 10-15 minutes (this makes the bacon nice and flat when it's done). Lightly grease another cookie sheet. On a lightly floured surface, roll out the pastry to about 1/2 inch thickness and a 10x8 inch rectangle. Score edges 1/2 inch in from the edge with a paring knife, and prick center with a fork numerous times. Place on prepared sheet, and brush edges with egg wash. Place in refrigerator for 15 minutes. Combine creme fraiche and cheese in a small bowl, and season with salt and pepper. Spread mixture over pastry, keeping border clean. Lay bacon on top, slightly overlapping pieces. Bake for 14 minutes, rotating baking sheet halfway through. Remove from oven, and pop any air bubbles with a fork. Crack eggs onto tart, spacing them evenly across. Bake until egg whites are set and yolks are still soft, about 7-10 minutes. Transfer to a serving platter, garnish with chives and serve. KJM Tip: Use a cookie sheet with edges for the tart. When you crack the eggs on top, they have a tendency to run all over the place before they set up. Including onto the bottom of your oven. Not that I speak from experience or anything.